‘’He touches the painful swelling on his thigh and armpits and asks me ‘appa, what is wrong with me? Why am I always in pain?’ and I can never think of the right thing to say to him. He knows this is not normal, but I don’t have the strength to tell my son that he will die of cancer without treatment. Cancer has not only made him physically weak, but he’s extremely depressed. Even when the other patients tell him he’ll be fine soon, he just stares ahead blankly. He’s slowly slipping away from us.” – Durai, Ritish’s father. Just over a month ago, Ritish’s unstoppable energy and his infectious laughter kept Durai and Vijaykumari on their toes. Every morning, he would hop on to his favorite cycle and peddle away to the nearby field. However, Ritish can now barely move without being in pain. His cycle remains untouched, and everything that once made him happy is only a distant memory. 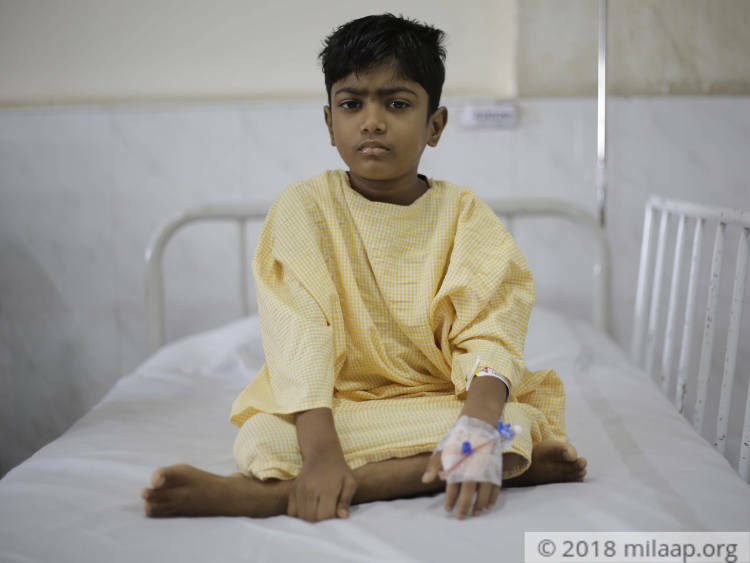 As much as he wants to get back on his feet, Ritish is helpless because of the deadly disease that has taken over his life – cancer. Ritish has been undergoing chemotherapy for a month now. 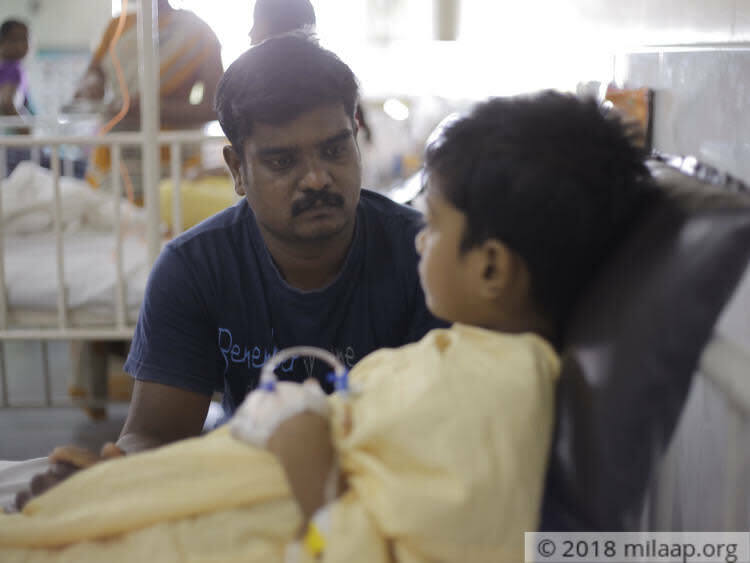 Often, Durai and Vijaykumari sit by his side remembering the day that changed all their lives forever. Vijaykumari tries her best to stay strong for Ritish. On the days when he barely speaks, she holds back her tears and tells him stories to try and cheer him up, but nothing makes him feel better. 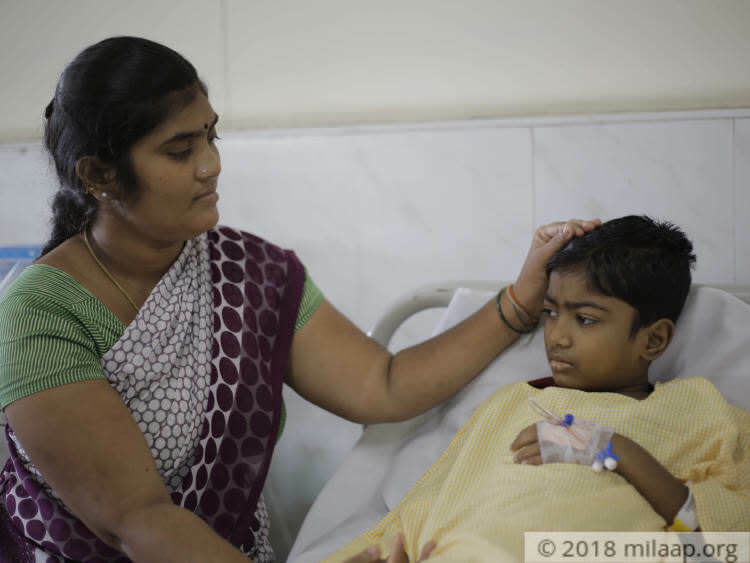 Durai and Vijaykumari wasted no time in getting their son's treatment started. 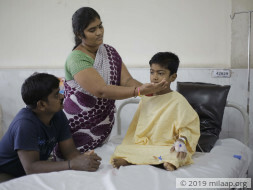 After selling the little jewelry they had and borrowing from family, Ritish's chemotherapy began. Unfortunately, it isn’t enough. Durai, who works as a security guard in a mall in Chennai, can’t afford the 4 lakhs needed to save Ritish. 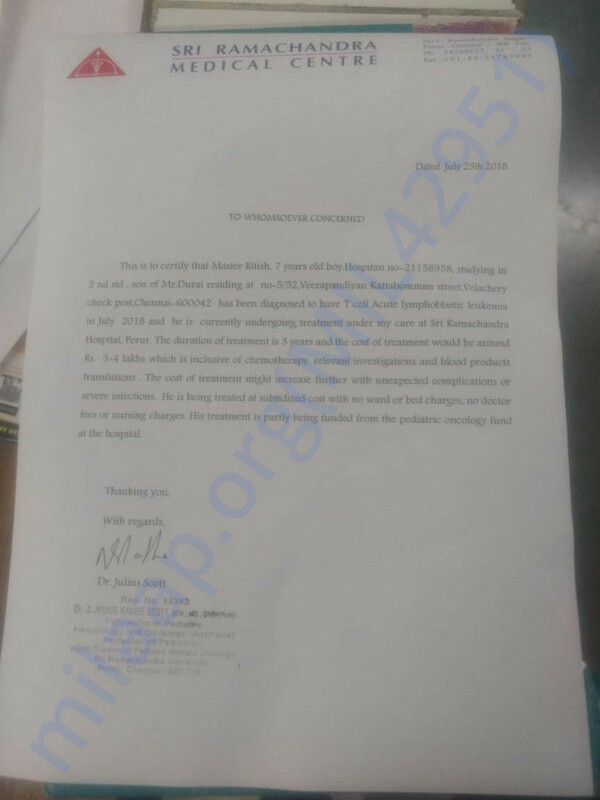 His monthly income far exceeds the monthly costs of Ritish's treatment and Durai has no way to overcome this financial hurdle. 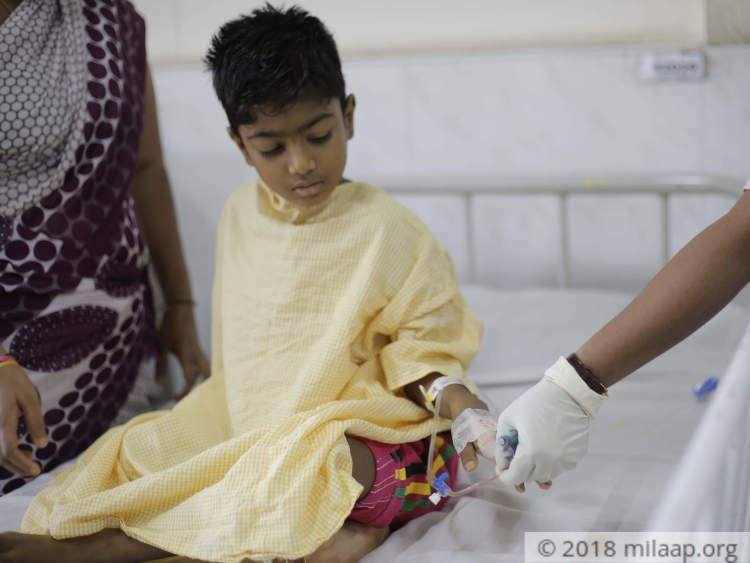 Ritish needs chemotherapy to beat blood cancer, but his parents are at a dead-end. With all their savings exhausted on his treatment so far, Durai and Vijaykumari spend all day worrying. 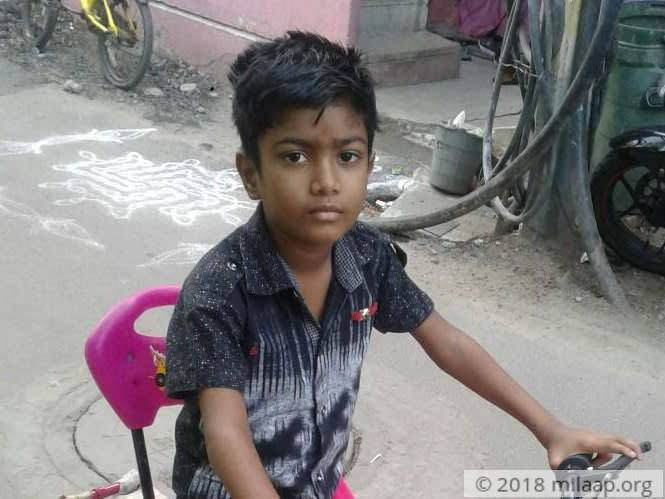 Ritish is eagerly waiting for the day he can go back home and play on his favorite cycle again. Only you can help save him from cancer. 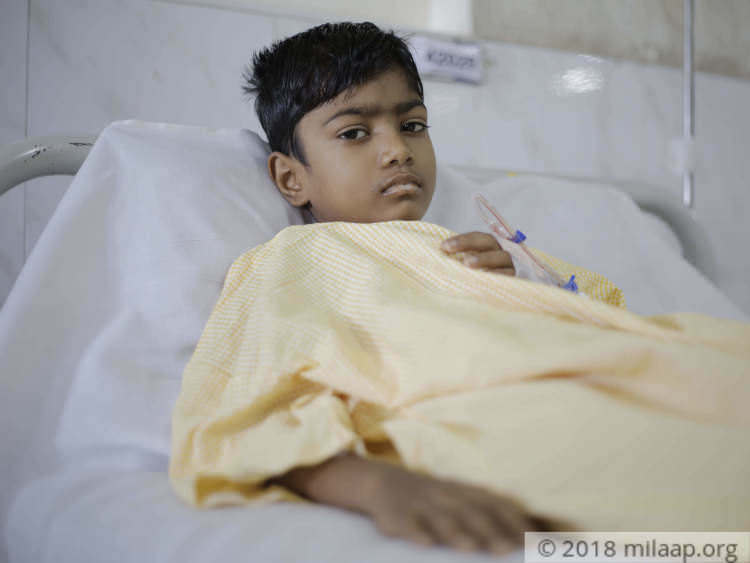 Your support will save Ritish’s life. I thank you for all the support you have shown. The third cycle of chemotherapy has just begun. Ritish is suffering from hair loss, vomiting and skin discoloration. He is still on liquid diet and resting at home. I request all of you to continue sharing the campaign and thank you once again. Thank you for supporting Ritish! He has finished his 2nd cycle of chemotherapy and is at home. His blood counts have dropped and the 3rd cycle of chemotherapy cannot be started until the blood counts show improvement. He has an apparatus inserted in his chest to help deliver medication to his heart because of which his movement has been restricted. He is on a liquid diet as solid foods are inducing vomiting. Please continue to share this campaign with your friends and family!